Welcome to the new Flowerona! Over the last few weeks, I’ve hinted now and again that behind the scenes I’ve been working on something very special. I’ve been bursting to tell you, but I really wanted to wait until everything was ready. And today is the big day, which is also my blog’s 4th birthday! What better way to celebrate than with a brand new, improved Flowerona? The home page gives you a visual snapshot of what you can find on the website. In particular, it includes up-to-date links to the latest blog post, workshop and video. Beautiful photos have always been very important to me and now, they’re bigger. You can pin images direct to Pinterest. Simply hover your mouse cursor over an image and a ‘PIN IT’ button will appear. To make it easier and quicker for you to scan through blog posts, from tomorrow you’ll see the start of a post and then a ‘read full article’ button. At the end of each blog post, you’ll see ‘pin this’, ‘share this’, ‘tweet this’, ‘email this’ links, which you can use to share Flowerona posts. There are now more options for advertisers with Gold, Silver and Bronze categories of banners. Find out about the latest Flowerona workshops for florists in this new area. I set up the Flowerona for Florists Facebook Group back in April and I’m thrilled that there are now over 1,000 members from all over the world. If you’re not already a member and would like to join this very friendly and supportive community of florists, then please visit this page. I’m frequently contacted by florists who are looking for staff as well as florists who are looking for a new position. So, I’ve set up a Job Vacancies board as a place to advertise vacancies and your services. In addition to writing the Flowerona blog, I also have some other ‘hats’. They include Writing, Training, Consulting, Speaking and Presenting. And in this section, you can find more details about these others areas. I’ve written a new FAQ (Frequently Asked Questions) page, covering everything from advice on floristry courses to recommended florist shops to visit in London. You’ll now find links to my Flowerona accounts on Instagram, Pinterest, Google+ and YouTube. Shortly, I’ll be updating all my social media accounts with the new logo and branding. Lots of people who I’ve featured on Flowerona have asked me for a ‘Featured On’ badge to put on their website or blog. I’m thrilled that I now have a range of badges in different colours and styles available. Simply send me an email and I’ll send you a link to this page, where you can choose a badge. Earlier in the year, I had a new set of profile photos and general shots taken by the very talented photographer Vicki Knights, which I’ve integrated into the new website. When you first visit the site, you may notice a message about cookies which I’ve added to comply with the EU Cookie Law. Simply click No problem and/or More info. Nearly 40% of Flowerona readers access the site using a phone or tablet. So, this new website is responsive. When you look at Flowerona on your computer, you’ll see the full view of the site. And when you visit it on your phone or tablet, Flowerona will retract to fit on the smaller screen. I think that just about covers all the changes and enhancements! I hope you enjoy taking a look around the new Flowerona and like the makeover. I’d love to know what you think. So please do tweet, Facebook or Instagram me, send me an email or leave a comment below. I’m very, very excited about Flowerona’s future and I hope you like my new site. P.S. 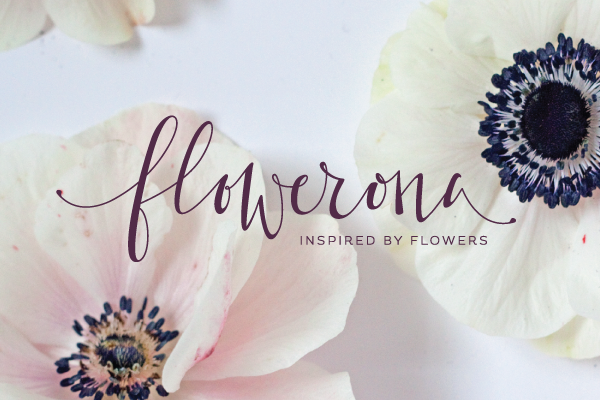 Look out for my next blog post today, where I’ll share the story behind the Flowerona Rebrand. Congratulations Rona. I know just how much work goes into getting a site live, you deserve to be very proud! Huge congratulations Rona!! YOU DID IT!!!! my my you have been busy. well done on a great job. you make everything seem so effortless but always manage to pull off something which is well organised informative and polished. we are not worthy (bow bow). Well done on the rebrand, everything looks fabulous!